Here comes summer! Sandy beaches, blue skies, outdoor adventures…there’s a lot to do and love about the season. 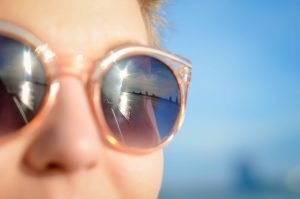 There’s only one problem -all that fun in the sun can lead to vision problems later, including cataracts and vision-stealing eye diseases. Grab your favorite hat. Wearing a hat is one of the best ways you can keep the sun’s rays at bay. Wide-brimmed hats in particular are great tools, as they offer the most protection and hide your eyes from sunlight that would otherwise beam down on them. Wear some shades. Even with a hat, sunglasses are a must! Good shades will stop any reflecting UV rays from getting into your eyes and causing damage as they bounce back up from below. 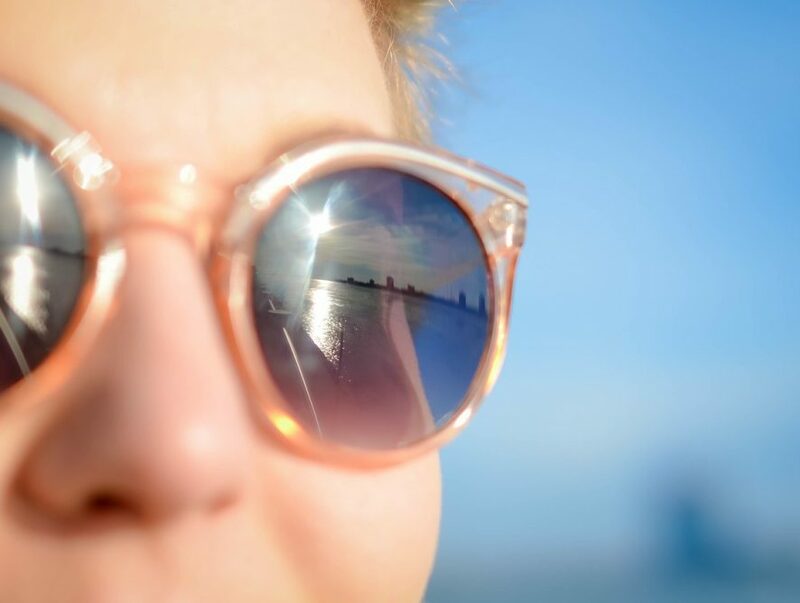 “Good shades” means a pair that blocks out 99 to 100 percent of both UV-A and UV-B radiation! Beware of dryness. This time of year is especially likely to dry out our eyes. The warming weather can contribute to and irritate a common condition called dry eye. Dry eye is the result of your eyes not producing enough tears to keep your eyes moist. Without a good moisture level, you’ll feel uncomfortable at best – and you’ll also be more likely to develop eye infections. Wrap-around glasses that keep the wind from your eye’s surface, combined with eye drops, are good ways to combat any occasional dry sensations. Sunlight and summer weather aren’t the only potential sources of dry eye symptoms, however. Nearly 60% of us use a digital device for at least 5 hours a day. All that screen time adds up fast! And you don’t blink as often when you’re on a tablet, computer, or watching TV. Less blinking means drier eyes. You can take breaks every 20 minutes. Ideally, you’ll stop for at least 20 seconds and look at something at least 20 feet away – this is known as the 20/20/20 rule. You can follow good workplace setup guidelines, such as keeping your screens at least an arm’s length away – because the closer the screen, the less you blink! You can make the text on your screen bigger and easier to read. You can control the amount of light and glare from your screen. The blue light emitted from all screens, combined with the glare of poor light sources, can force our eyes to work harder and make dry eye symptoms more pronounced. So cutting down on both glare and light exposure can make a big difference in how you feel! If your eyes are feeling the strain of the season, we can help! Phonetic Eyewear offers high quality blue light filter glasses and lenses designed specifically to deflect a portion of unwanted blue light. Our reading glasses, and also prescription glasses frames are perfect for any time you spend working at your computer or tablet. Plus, they’re stylish enough to wear all day long on your next summer vacation! Start searching for the blue light filter glasses you need and deserve at our website, where you’ll find a series of collections featuring all sorts of stylish frames. You’ll look and feel your best at the beach this year after shopping with us!